Emergency Medical Services were originally formed in Chester to comply with Federal and State guidelines which state, “All cities and towns will receive Emergency Medical Services” and fell under the jurisdiction of the police department as they were readily accessible and available. As requirements for police officers and emergency medical personnel became more stringent, the police department found that emergency medical care was becoming more of a burden and asked to be released from their commitment in order to concentrate more on their primary duties of law enforcement. 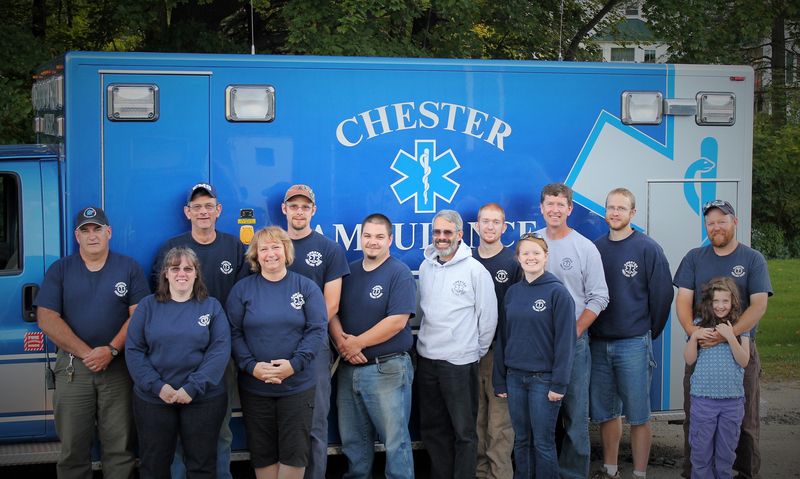 As a result, Chester Ambulance Service was officially created during February of 1980, with its own coordinator, members and taxpayer supported budget. Chester is located in the south-eastern part of Vermont at the intersection of two major Vermont highways. We have many tourist attractions and are within 30 minutes of 4 ski areas. A Vermont rail system runs through town and we are directly under the flight path for Springfield State Airport. Chester Ambulance Service is licensed by the Vermont Department of Health at the Intermediate level and has an average call volume of 300+ per year. We have 1 transport vehicle and 16 part-time paid volunteers that range in certification from First Responders to advanced EMTs. With resources such as police and fire department response, paramedic intercept, air transport and our primary receiving facility only a few miles away, we feel that we are able to offer the most up to date pre-hospital care available in a rural setting such as ours. 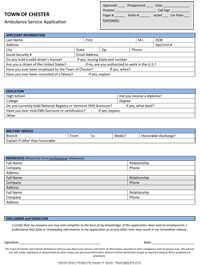 Interested in Joining the Service?